This White primed CLIMADOOR FrenchFold Doorset is offered with frosted glass for extra privacy. 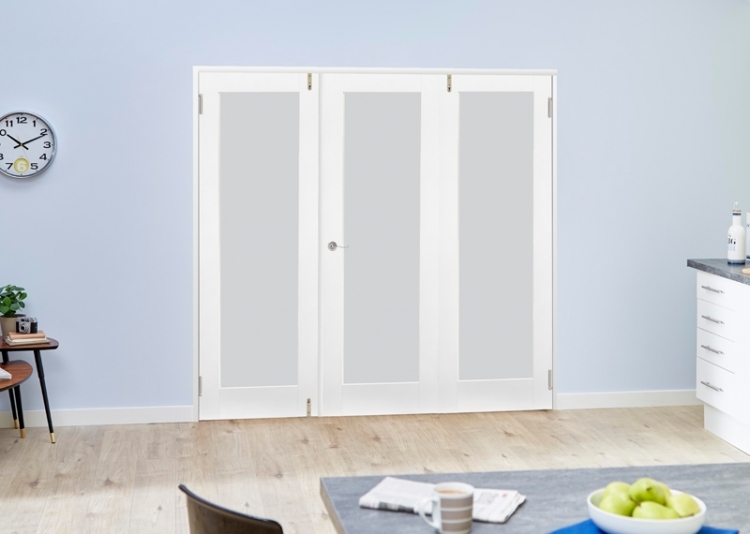 This white internal room divider door system is offered in several opening sizes from 1684 wide through to 2826mm with a central opening access door or doors, giving the benefits of both internal french doors, with their central opening, but also the benefit of internal bifold doors allowing the whole space to be opened up. These frenchfold systems are available in 3 and 4 door systems, using 533mm, 573mm, 610mm and 686mm wide white primed internal doors you ensure that installation is made simple with no planing of doors on site and a simple installation routine to follow to assemble the doors and frame in the opening. These doors when fully opened can fold back against the adjacent wall, maximising your opening space. This set comes with universal frame set, pivots, hinges, brushed stainless steel drop bolts and pre glazed oak doors..all you need is a handle and latch!